Any currency’s volatility is unstable. Sometimes the volatility is high, and the bot makes many profitable deals. Sometimes the price doesn’t change, and the bot has to idle. The bot may also end up idling if the initial trading pair doesn’t correspond with the start filters. To avoid bot downtime, we’ve implemented automatic trading pair switching. 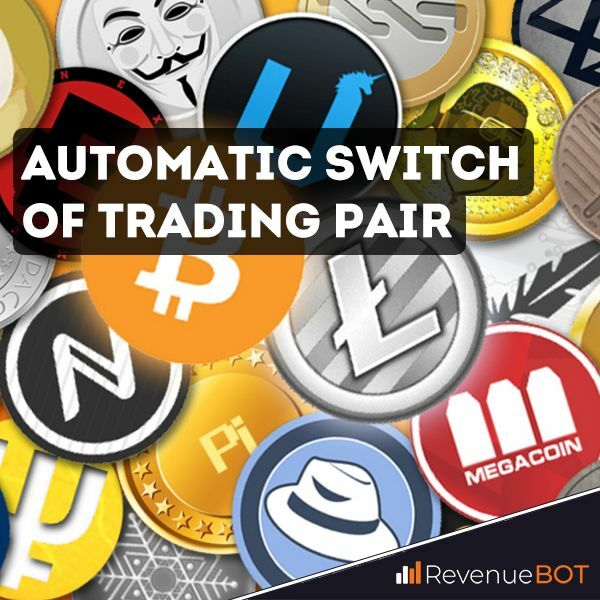 Automatic switch of trading pair according to the user list. If the current trading pair doesn’t correspond with the start filter requirements, you can create a list of different trading pairs, the bot will search this list until it finds the pair that fits the start filter. If you have several bots with the automatic switch function enabled, and you want every bot to trade with a unique trading pair at the same time – use the setting «use only unique trade pair». This setting only works for bots with the automatic switching of trading pair function enabled. How to turn on automatic switch of trading pair according to the user list? In order to enter this mode, you need to activate the “enable automatic switch of trading pair” menu in bot settings. Next, click on the “User List” option in “Switch type” menu and make a list, adding the needed cryptocurrencies. Automatic trading pair switching according to the volatility analyzer results. At the start of its operation, the bot may change the preset trading pair for a different one, with more profitable volatility indicators. The volatility analyzer calculates the number of multidirectional price changes that have recently happened, and it is used for cryptocurrency volatility evaluation. The bot switches to the currency with higher volatility. If you have several bots with the automatic switch function enabled, and you want every bot to trade with unique trade pair at the same time – use the setting «use only unique trade pair». This setting works only for bots with the automatic switching of trading pair function enabled. It’s important not to not only choose the currency with higher volatility, but also to eliminate those currencies that involve trading risks. Trading risks can be seen with unfamiliar cryptocurrencies, very cheap cryptocurrencies (with a price <0.00000050 BTC), and cryptocurrencies liable to pumps/dumps. It’s also important to screen cryptocurrencies with a low daily trade volume (<300 BTC). All the above-mentioned volatility and trade risk indicators may be adjusted within the volatility analyzer. The analyzer is accessible both while creating/editing a bot, as well as via the following link to the “Tools” page https://app.revenuebot.io/office/#/tools/. You can test the volatility analyzer with different settings to see its operation results and choose the correct settings for the given crypto-exchange and market. Create volatility analyzer settings presets to use them with automatic trading pair switching. How to enable automatic trading pair switching according to the volatility analyzer results? 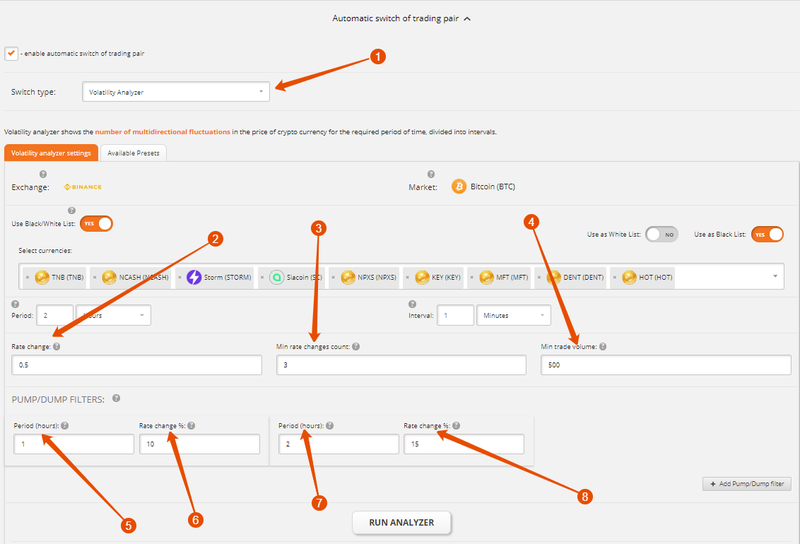 In order to enable automatic trading pair switching according to the volatility analyzer results, you will need to activate the “enable automatic switch of trading pair” menu in bot settings. Next, in the “Switch type” menu click the “Volatility Analyzer” option to access the volatility analyzer settings menu. Here you will have the option to choose your preset settings. How to adjust volatility analyzer settings? Choose an exchange for cryptocurrency volatility analysis. Choose a market for cryptocurrency volatility analysis and the cryptocurrency, being traded. As a rule, it’s a large-scale cryptocurrency like BTC, ETH, or USDT. You may use a black/white list to automatically switch only between trusted cryptocurrencies and to eliminate any risks. We recommend always using a black/white list to eliminate risks. Period, interval, Rate change % settings. The volatility analysis process considers a preset period of time (Period), split into intervals (Interval). The analysis calculates the number of multidirectional price variations for all the cryptocurrencies on the chosen market (Market) at a certain rate change (Rate Change) in every interval (Interval) for a certain time period (Period). E.g., to obtain an actual volatility estimate, you will need to know the way the prices on a certain market varied for the last hour (period), split into 1-minute intervals. A variation is considered valid if the price changed by 0.5%. Since the period is set for one hour, split into 1-minute intervals, the analyzer will sequentially process each of the 60 intervals for the previous hour in every training pair on the chosen market. If any of the analyzed intervals shows price variation of 0.5%, it’s considered valid for the chosen trading pair. We do not recommend conducting a volatility analysis for a time period of >48 hours because the result will bear no useful information for volatility estimation. We also recommend using a 0.3% – 1% rate change to estimate volatility. The mentioned setting defines the minimal number of registered variations used for choosing the trading pair for automatic switching. When adjusting this setting, consider the above-mentioned period (Period) and rate change (Rate Change). E.g., if the minimal count of registered variations is set to 3 (Min rate change count), only those cryptocurrencies with at least 3 registered variations will be possibilities for switching. We recommend using 3, 5, or 10 variation counts. 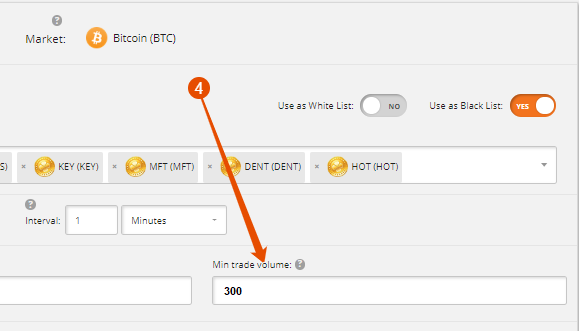 This setting defines the minimal trade volume (for the last 24 hours) suitable for choosing the trading pair for automatic switching. The trade volume is calculated using the chosen market currency. The bigger the trade volume, the safer the trading. We recommend using a minimal trade volume equivalent to 300 BTC (12000ETH, 1000000 USD). In this menu, you may activate a pump/dump filter to exclude risky trade pairs from the automatic switching list. Use several filters for a more precise evaluation. In every filter you will need to define the evaluated time period and a pump/dump strength (Rate change). E.g., a “15 minutes – 10%” filter will exclude any pair with a price variation of 10% during the last 15 minutes from the automatic switching list. After the volatility analyzer has been set up, save your bot by clicking the “Create new bot” button if you need to create a new bot, or by clicking the “update bot” button if you’re updating a previously created bot. Now, when the bot chooses a trade pair, it will use the defined volatility analyzer settings. Additionally, if you would like to see the adjusted volatility analyzer operation results, click the “run analyzer” button. Processing the result may take 1-2 minutes. The volatility analyzer result is a chart with a list of trade pairs sorted in descending price variation order, registered for the given period of time. Create bot with automatic switching of cryptocurrency trading pairs to increase your daily number of cycles. Previous PostPrevious Bot smart start. Create and manage filters.